Xiaoxiang Deng Ph.D. Integral Molecular. Epitope information is increasingly being used to understand the mechanism of action (MoA) of therapeutic monoclonal antibodies (mAbs), as well as to overcome the mounting challenges of patenting them. Differentiating mAbs by their distinct MoAs helps select the best lead mAb(s) for development and aids in regulatory filings. To protect the intellectual property (IP) of such mAbs, epitope data is being used to support patent novelty, establish non-obviousness, and satisfy the recently tightened written description requirement for broad antibody claims. High-resolution epitope maps allow differentiation between mAbs, including those that have competing binding sites. Applying a mapping technology that provides epitopes at amino acid resolution, even for conformational epitopes against difficult targets, can increase the breadth and strength of mAb patents. Epitope mapping helps to differentiate candidate mAbs that have the most therapeutically promising MoA. An epitope in a defined functional region of a protein informs the mechanism by which the mAb affects protein function, an important component of regulatory filings. For example, mAbs can block a ligand, inhibit protein-protein dimerization, or prevent a conformational change required for function. Thus, knowledge of a mAb’s binding location helps to clarify exactly how binding modulates target function, and which mAbs might have the most value. For lead selection, choosing mAbs with diverse MoAs provides unique therapeutic candidates that each act on the target differently. Defining MoA is also important for selecting which components will be combined in therapeutic cocktails, which are increasingly being used to treat diseases where escape mutations can thwart the efficacy of a monotherapy. For example, an experimental three-mAb cocktail (ZMapp™) was used during the recent Ebola virus outbreak in West Africa, and new inhibitory mAbs have since been identified. Understanding where each component mAb binds relative to the functional regions of the protein provides a rationale for choosing the most synergistic combination of mAbs, each with a unique epitope and MoA for virus inhibition (Figure 1A). For a patent to be allowed, the invention must be shown to be useful, non-obvious, and novel. Patents must additionally fulfill a written description requirement showing that an inventor is “in possession” of the invention. Epitope mapping data is being used to meet these requirements for antibody patents. For example, epitope data has been central in high-profile cases such as Biogen v. GlaxoSmithKline (differentiating epitopes for CD20 mAbs fulfills novelty, Federal Circuit, 2013) and Amgen v. Sanofi (high-resolution epitopes for multiple PCSK9 mAbs fulfills written description, District Court of Delaware, 2017). For an invention to be non-obvious, it should not be readily conceived by others who are reasonably “skilled in the art.” Claims for mAbs with linear epitopes can be subject to obviousness challenges, since the target antigen’s sequence and the use of corresponding short linear peptides for immunization are now deemed to constitute routine practice. By contrast, mAbs targeting conformational epitopes are more likely to be considered non-obvious, since these mAbs recognize a complex three-dimensional binding site formed by association of nonsequential regions of a protein. This type of conformational epitope is not easily predicted from antigen sequence and can be obtained only from immunization with a large and complex immunogen. Thus, epitope mapping data that demonstrates targeting of a conformational epitope strengthens assertions of non-obviousness in a mAb’s patent claims. Epitope-mapping data are particularly valuable for later-generation mAbs, allowing a clear demonstration that a mAb is novel, not “anticipated,” and distinct from “prior art.” The demonstration of novelty has grown increasingly important as the therapeutic mAb field becomes more competitive, with multiple companies developing distinct mAbs that target the same protein. For example, the cancer target HER2 has been successfully targeted by two FDA-approved mAbs, Herceptin® (trastuzumab) and Perjeta® (pertuzumab). The developers of an additional molecule (Fynomer C12) were able to claim the novelty of its epitope in a new patent by demonstrating that this epitope was distinct from the epitopes of existing mAbs and therefore was not previously described by prior art (Figure 1B). The written description requirement of an antibody patent specifies that an inventor must adequately describe an invention to demonstrate that the inventor is “in possession” of the invention. A successful written description can also be used to support broad claims around the epitopes of a group (or “genus”) of mAbs. The breadth of such epitope claims was recently demonstrated by Amgen’s US8829165 and US8859741 patents claiming the detailed epitope residues for mAbs against the target PCSK9 for Amgen’s Repatha® (evolocumab). Because detailed epitopes for several representative mAbs were included, Amgen’s patents cover a broad genus of mAbs that bind to the epitope residues that Amgen identified. Sanofi’s competitor mAb Praluent® (alirocumab) recognizes residues overlapping those of Amgen’s, forcing Sanofi to defend itself against Amgen’s patents in court. While the case remains contested, it is clear that the detailed epitope residues and the number of mAbs epitope mapped in this case have defined the legal breadth of patent protection. Figure 1. Epitope mapping differentiates MoAs and strengthens IP claims. (A) Mechanisms by which mAbs neutralize the Ebola virus glycoprotein (GP) have been defined by epitope mapping (MoAs 1–4). Each mAb can neutralize infectivity by inhibiting one of a number of steps essential for infectivity: mAb-receptor interaction, membrane fusion, proteolytic cleavage, or transmembrane structural rearrangement. Select combinations of mAbs with different MoAs have led to highly protective cocktails of therapeutic antibodies. (B) The amino acid binding site for a novel epitope (Fynomer C12, orange residues) strengthens IP claims by establishing novelty (because the epitope is distinct from other epitopes on HER2, such as those for trastuzumab and pertuzumab) and non-obviousness (because the epitope forms a conformational epitope of discontinuous residues). It also and fulfills written description requirements by identifying the specific amino acids energetically required for its binding. A number of technologies are used to map epitopes, with varying degrees of relevance for identifying MoA and protecting IP. Each technique has its merits, and in many cases, multiple approaches are utilized depending on a mAb’s stage in research and development. For example, co-crystallography and cryo-electron microscopy enable direct visualization of the interaction between the antigen and mAb, but these techniques are still limited. They cannot always be applied to complex proteins. They usually require substantial time and resources. And they do not identify which residues within a binding footprint are driving the energetics of the interaction. Similarly, peptide scanning, hydrogen-deuterium exchange, and epitope binning can be fast and efficient for linear epitopes. These techniques, however, cannot provide amino acid resolution and cannot always be applied to conformational epitopes or complex proteins. To provide a robust and rapid solution for comprehensive site-directed mutagenesis, Integral Molecular has developed Shotgun Mutagenesis Epitope Mapping, a technology that works directly in human cells and combines comprehensive alanine mutagenesis, expression, and detection (Figure 2). This technique has been used to map over 500 epitopes to date, with a success rate of greater than 95%. Epitopes successfully mapped include conformationally complex epitopes on soluble proteins, membrane proteins (including 1TMs, GPCRs, transporters, ion channels, and viral proteins), and complex epitopes dependent on multiple subunits or specific conformational states. The success of this technique is based on assessing the binding of mAbs to conformationally intact proteins expressed in their native form directly within live human cells. This approach provides single-amino acid-resolution epitopes, pinpointing those that are energetically critical for binding. Because it offers high-resolution epitopes even for conformationally complex proteins and epitopes, Shotgun Mutagenesis Epitope Mapping has been used to differentiate the MoAs of lead mAbs entering the clinic as well as to establish defensible IP claims by showing that the mAbs are novel and non-obvious, and fulfill written description requirements. Antibody-drug discovery is a resource-intensive process in terms of both time and money. For the success of the most promising mAbs, epitope mapping elevates the value of mAb drug candidates by providing data to secure their IP and by helping to differentiate their therapeutic MoAs. Figure 2. 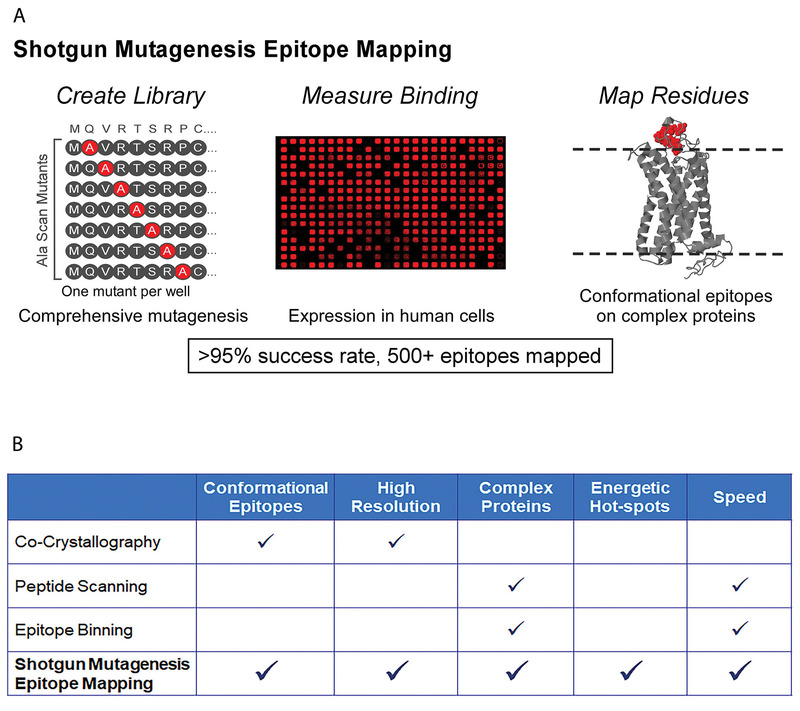 Shotgun Mutagenesis Epitope Mapping provides high-resolution, conformational epitopes with >95% success. (A) The epitopes of over 500 mAbs have been mapped using Shotgun Mutagenesis, including epitopes that are components of complex proteins and conformation-dependent mAbs. Shotgun Mutagenesis uses high-throughput alanine scanning and expression in human cells to identify critical residues for binding. (B) Shotgun Mutagenesis has been used to elucidate epitopes at amino acid resolution, identify which amino acids form the energetic hotspots of binding, and rapidly map dozens of conformational mAbs simultaneously. Soma Banik, Ph.D. (sbanik@integralmolecular.com), leads scientific communications, Xiaoxiang Deng, Ph.D., leads intellectual property strategies, and Benjamin Doranz, Ph.D., is president and CEO at Integral Molecular.